What was it with all of these 80s soap stars suddenly trying to launch a pop career? Okay, so it worked for Kylie, but this has to be the most cringeworthy of all the single releases by soap stars - even Don't It Make You Feel Good by Aussie soap star Stefan Dennis seems like a masterpiece compared to this! 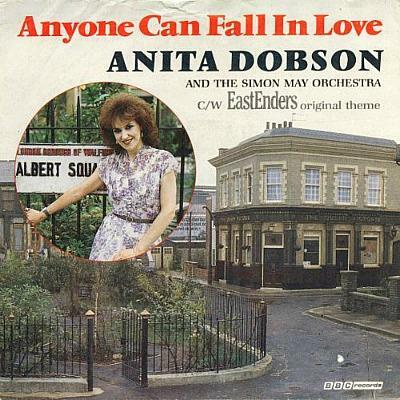 Anita Dobson (who played Angie Watts in Eastenders during the eighties) managed to reach #4 in August 1986 by singing over the Eastenders theme tune, Anyone Can Fall In Love. The song was written by Simon May and produced by Anita Dobson's husband, Queen guitarist Brian May (he should've known better!) with lyrics by Don Black. The video above features a live (mimed) performance on BBC TOTP. All I can say is aaarrrgh!! My toes are curling! Yes, even Angie Watts' adoptive daughter wanted to get in on the act! Letitia Dean (who played Sharon Watts) released this single with Paul J. Medord (who played Kelvin Carpenter) entitled Something Outa Nothing which reached #12 in the UK charts during November 1986. The song was first performed by the duo on Eastenders as part of a storyline featuring a fictional band called "The Banned" - I think they should have been! In the show, The Banned also included the members Simon Wicks, Eddie Hunter, Ian Beale and Harry reynolds, but they never had any part in this single release.